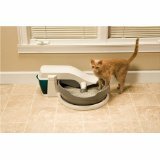 PetSafe Simply Clean Review – Find the best automatic litter box here! The PetSafe Simply Clean Self-Cleaning litter box works around the clock to eliminate your cat’s waste. It cycles automatically to get rid of waste four times per day, although you can set it to cycle whenever you’d like. Each cycle takes a full hour to complete. Waste is raked into a large holding compartment, which you can line with a plastic bag if you’re concerned about sanitation. The holding compartment is dark green but see-through, so you can see when it’s time to change the bag. According to Amazon reviews, the box won’t usually need changing for nearly two weeks at a time. Cats who are finicky about their favorite type of litter will acclimate to the PetSafe box quickly. The PetSafe uses any type of clumping litter, so you can keep using the brand your cat loves. The PetSafe Simply Clean won’t rotate when your cat is inside it, so there’s no danger of its fur getting caught in the cycling mechanism. The box is suitable for kittens and cats weighing up to 15 pounds. Users have reported that it works for up to four cats, although your experience may vary depending on your cat’s weight and size. This box is reportedly quieter than other similar boxes that cycle automatically. That makes it a good choice for almost any room in your home, since the motor won’t disturb you at night. Some users have reported that the conveyor motor wore out in their boxes. If this happens within your warranty period, you can get it repaired for free. Small waste particles may get left in the box if the rake doesn’t catch them. The quiet motor may get slightly louder with age. This normally only happens after about a year or two of use. To buy the PetSafe Simply Clean or learn more on Amazon, click here. 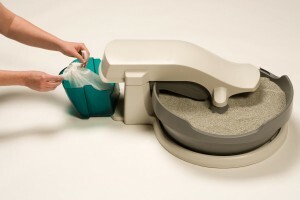 Watch the video below to see the Simply Clean litter box in action. Click here to return to the comparison chart.